Jurassic World is a 2015 American science fiction adventure film, the fourth installment of the Jurassic Park film series, and the first film in a planned Jurassic World trilogy. It was directed by Colin Trevorrow, written by Derek Connolly and Trevorrow, produced by Frank Marshall and Patrick Crowley, and stars Chris Pratt, Bryce Dallas Howard, Vincent D’Onofrio, Ty Simpkins, Nick Robinson, Omar Sy, BD Wong, and Irrfan Khan. Production was completed on May 10, 2015, and Jurassic World was released in over 60 countries beginning on June 10, 2015. 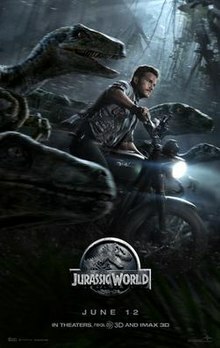 After a record-breaking opening weekend during which it became the first film to gross over $500 million, Jurassic World generated $1.6 billion in box office revenue, ranking fifth among the highest-grossing films of all time. It was also the second-highest-grossing film of 2015 and the highest-grossing in the franchise. A sequel titled Jurassic World: Fallen Kingdom was released in June 2018.